Won the Girls’ Budapest Championship under 11 at the age of 4 with a perfect 10-0 score! Sponsor and organizer of the prestigious annual SPICE Cup, SPICE Spring Invitational, NY City Mayor’s Cup, Susan Polgar Girls’ Invitational Championship, Susan Polgar World Open and Susan Polgar National Open for Girls and Boys, etc. Head Coach of the Texas Tech #1 ranked and National Championship teams (6/2007-6/2012), which captured 15 national, 2 state, and 2 regional titles in 4 years, and Webster University #1 ranked and National Championship teams (6/2012 – present), which captured 33 national and 2 world titles in 3 years. 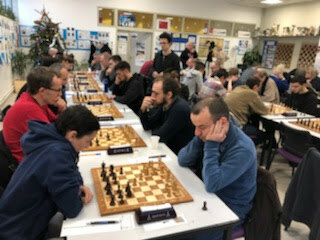 Samedi 13 avril à 17h : Tirage au sort du 1er tournoi Chess In Lyon à norme de MI !